Before introducing the Irish Immigrants’ Letters, you will want to be clear about your own objectives and expected outcomes. Below, we have identified objectives and outcomes we would use to guide our approach if we were teaching a social studies unit on immigration to 8-12 graders. These letters are extraordinary primary source documents. We would want students to mine the text to learn about the lives of the authors, both in the context of the historical period in which they were living and to better understand the experience of immigration itself and how it impacts the way people see themselves and the choices people make. We would be looking to help students explore the multitude of experiences and challenges that come with migration. We encourage you to inform your classroom lessons and discussions with these guiding questions in our developing framework. You can explore the framework on this page. Why would people choose to leave their homes for another country? How does migration impact both migrants and those they leave behind? How do people become acculturated into their new homelands? And, how does the treatment of newcomers impact their sense of belonging? What can people do to build bridges between newcomers and those whose families were already settled in a community? What can be done by those who already are established? What can newcomers do? What can these letters from Irish immigrants in the US tell us about migration and its experiences? What insights do the letters offer into the journey to America from Ireland? What do the letters suggest about the authors’ lives in Ireland? What is unique about the stories that we encounter in these letters? What universal themes do the letters raise? Invite students to reflect on the first essential question for the lesson, “why would people leave their homes for another country?” This is an excellent question to consider with the think-pair-share teaching strategy. First, ask students to gather their reflections in writing. Step two is to have students’ share their thoughts with a partner. Where do their ideas overlap? Where do they diverge? After the paired discussion, return to a whole group. See to see what students believe are the most common motivations for migration. Do they think people move for money, opportunity, because of climate change, war, and persecution? The title of this collection comes from a 1988 song by the Irish band The Pogues. The song is embedded below. Here is a link to the lyrics. As you listen, what images come to mind? What words, phrases, and sounds resonate with you? What do you think those details are meant to communicate? What do you think is the overall story of the song as a whole? What do they want listeners to think, know, and feel? Provide historical context on the Irish Potato famine. We have provided a brief overview of the history here. It is essential that students recognize that the famine, while an environmental disaster, was exacerbated by colonial policies. The letters in this collective offer some insight into the famine within the context of migration, however, the famine is a remarkable story on its own. Make sure this period is adequately covered in your school’s curriculum. Introduce the letters using the suggested guiding questions. Below each letter, we have also provided specific questions to focus readers attention on particular details within each text. Stepping back from the details, what story does each letter convey? What are the feelings the writers convey? Each of the letters offers insights into the story of Irish immigration during the famine. Ask students to identify what they know from the letters, what they think they know, and the questions that they have. Ask students about the connections they are making: what are they thinking about? How do the letters connect to other texts or histories with which they are familiar? After debriefing the texts, allow students time to reflect on two additional essential questions. How do the letters connect, extend, and challenge how students might have approached these questions before reading the letters? To close the lesson, introduce the final essential questions, “What can people do to build bridges between newcomers and those whose families were already settled in a community? What can be done by those who already are established? What can newcomers do?” What insights do the letters offer into those questions? To extend the unit, collect the migration stories of those in your school and community. 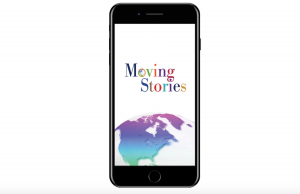 Our Moving Stories app strives to generate meaningful dialogue, hoping to encourage reflection across experiences of migration, identities, and generations. To learn more, we encourage you to explore the Moving Stories Educators’ Guide.